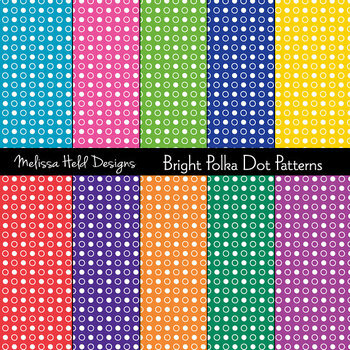 This is a collection of 10 fun white polka dot patterns on bright colorful backgrounds by Melissa Held Designs. You can use these patterns to create your own scrapbook paper, gift wrap, collage, party decorations, greeting cards, and for any other digital or paper craft project. Patterns are 12" x 12". This includes 10 JPGS. All files are instant downloads available to you as soon as payment is confirmed.